Welcome to the second part of my Know your enemy series in which I'm going to look at rare or unusual units, how they can be used best and how they can be beaten. 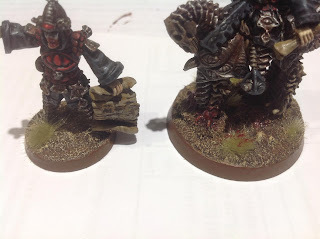 I keeping with both my themes from the last article and looking at both Forgeworld and Eldar. This time, it's the Hornet. Kudos to the paint job. Massive kudos! So it's a scout craft of the same ilk as the Vyper, basically. A light craft to support a lightning fast attack. Perfect for Saim-hann (and I would argue, pirates as well. Being as I'm using pirates and I want to use these. Badly). A nice simple background for a nice looking vehicle. Well its updated stats (for 6th ed) are in the new Imperial Armour Apocalypse so not everyone will have them, but there is a lot of very cool stuff in that book and a lot of it is 40k approved. Provided other people accept that of course. 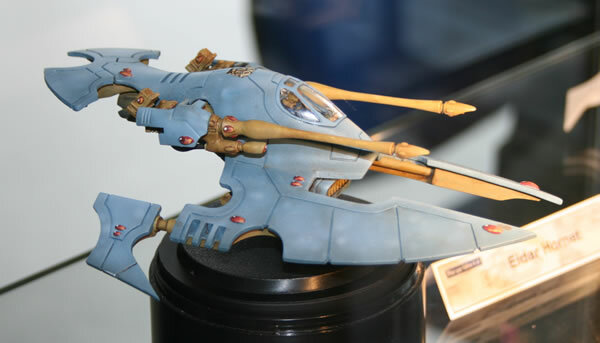 It's an AV 11/11/10, 2HP fast skimmer (like all Eldar vehicles really) with star engines and 2 shuricannon standard. This comes in at 70pts. Holofields, Vectored Engines and Spirit stones can also be added. So that's pretty tasty really isn't it? So how would it best be used? Add extra Hornets to taste. I'll probably use one or two solo hornets as support and to cut down on the points I'm putting into them but if you don't mind cutting out another toy they are a very good use of points. The Pulse Laser is the stand out weapon choice as for 5pts you get 2 S8 AP2 shots and BS4. This thing can eat a lot of vehicles with that and even bother TEQ. Also with its speed it can easily get side shots at Predators and the like, meaning you don't need the Lance rule from the Bright Lances so you can go with double the shots. 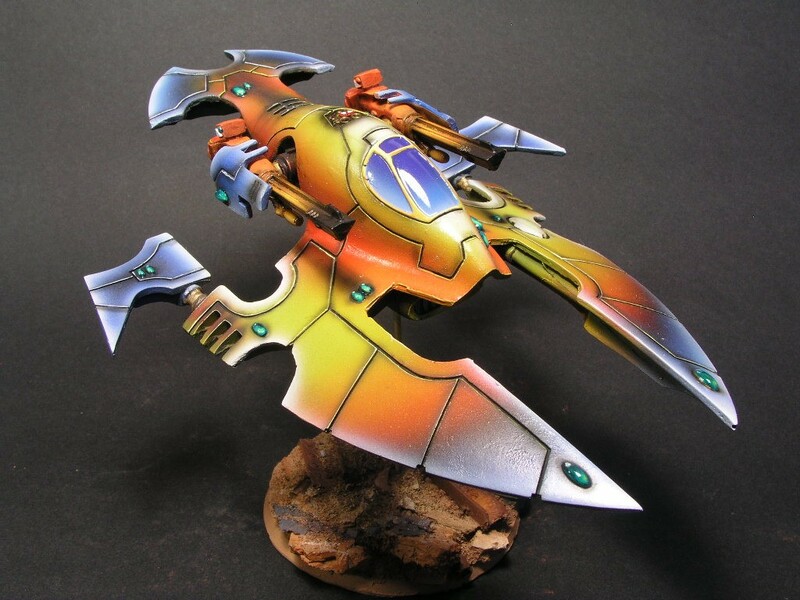 Speaking of speed, on top of the standard Eldar fast skimmer movement, it has scout (to push it 12" forwards at the beginning of the game), star engines (for a 24" flat out move) and skimmer assault. This last rule means that it can still fire snap shots after going flat out. Yes it's only snap shots, but think of the threat range with a 36" movement, 48" guns and a 12" scout! Ouch!! The Holofields are a must really. It's a light vehicle remember and the 4+ standard jink is pretty much necessary to stop it dropping like a stone. It also becomes a 3+ if you're using your flat out move. In my opinion outflanking with Hornets is a waste. If you're scared they'll get demolished immediately without too much of the enemy focusing on them, go for it. But they're so fast they can get where-ever, whenever they want and their firepower is both long-ranged and devastating so you want them smashing stuff right from the off. Prime targets for these are light-medium vehicles. Let your lances/wraithstuffs deal with heavy vehicles. Use your speed to get into side armour and block LoS to as much incoming fire as you can. With the increase of S6/7 weapons, they can drop pretty fast. They are immune to bolters however. This is HUGE and a big negative of the Vypers. So no worrying about infantry demolishing your Hornets if you want to dart in close for the kill. A final point is using them as anti air. With their super fast move they can nip behind a flyer when it enters (using skimmer assault, they'll be snap shotting to hit it anyway so it doesn't matter) and then open fire on its rear armour. If you put Vectored engines on them they can then spin to face the main enemy block, thus not revealing their weaker rear armour as well. Overall a very tasty unit. Squadrons of 3 probably being your best bet (for sheer terrifying damage output) but they will work well in any number. So how can we beat them? Holy hell! 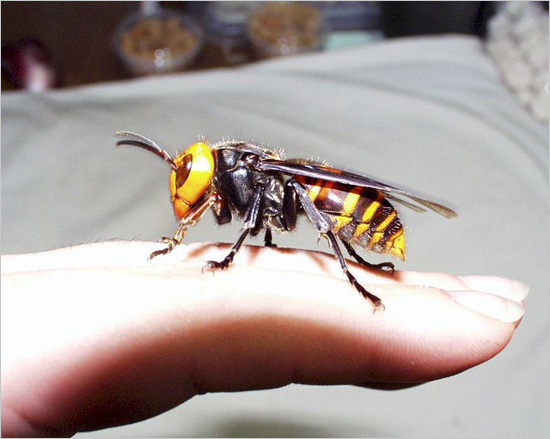 Actual hornets are BIG!! First things first, don't panic. They can dish out a lot of firepower but like all Eldar (except the new Wave Serpent) they are fragile! AV11 is better than a Vyper's AV10 but that's about it. There's a lot of S6/7 weaponry around at the moment and with only 2HP it only takes a couple of glances to take one down. There's going to be no way of stopping them shooting you. You have to accept this. But you can cut down their effectiveness if you look at your tank's positioning. Remember to hit side armour they need the angle on it, and maybe that angle would leave them right in front of your units. Hornets don't like being assaulted (their 4/3+ jink is useless in that case), especially not if you have grenades. So use this to dissuade them from going for side armour and instead they'll plink away at the front with their S8 shots. Yes that's still good, but it's not as bad on an AV12/13 as it is on an AV11. Other than that don't worry too much. 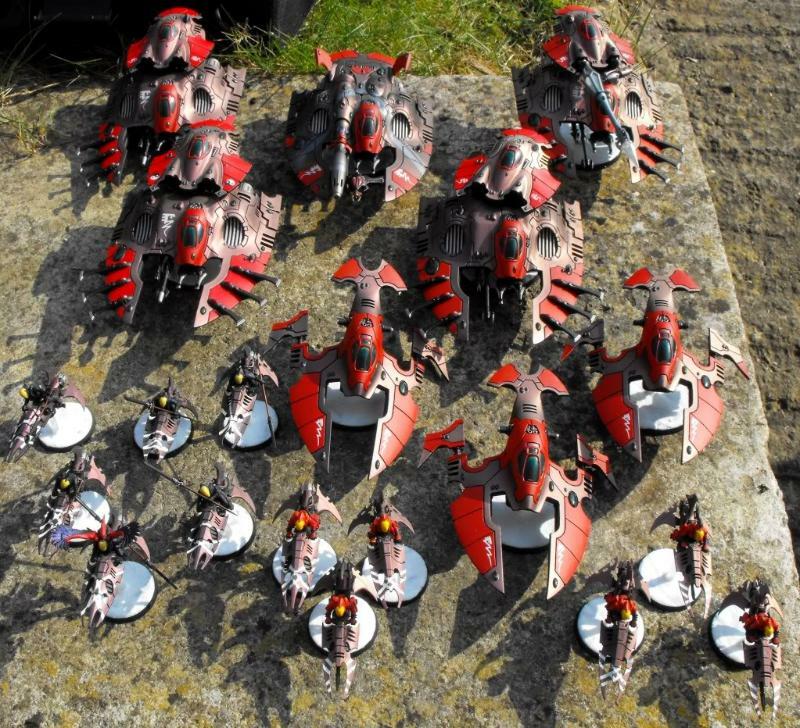 They'll likely be a nasty distraction and don't let chasing them down stop you from watching the other Eldar units. Just get some mid strength shots nearby and toast them. Your high S weaponry should be aimed elsewhere. As before if you have any requests just throw them out. The Blackwing Part 17 - 1500 points finished!